Convert Any Webpage Into PDF Without software. | Kanishk's Technical Blog. Convert Any Webpage Into PDF Without software. 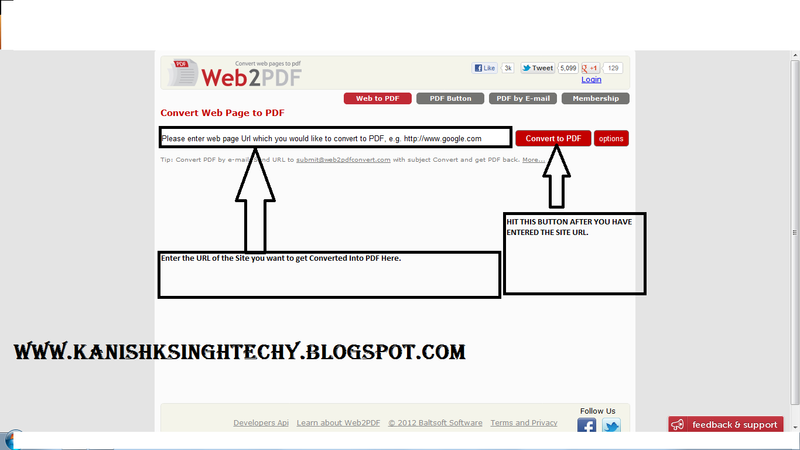 Hello Friends,Today I'll Post on CONVERT ANY WEBPAGE TO PDF. Well,Converting the Entire Webpage into a PDF is not too hard.All you need is a Few Seconds. 1. Go to this site- Enter Site. Click the Picture to Enlarge and Read the Instructions. 3. Now After you Enter the Site URL and Press the Convert to PDF Button you'll See a Page Like this. In our case,I have used My Blog URL and I am getting it converted into PDF. I Hope You like this Tutorial.Please Comment if it works or not I'll be grateful.